Despite all the years of research and development that have gone into creating the modern motorcycle helmet, is it possible there's a better way? I recently sat down with Bob Weber, formerly of Troy Lee Designs and currently the CEO of 6D, to talk helmets and the brain. I was familiar with the company's off-road helmets and the concept behind the design, but hadn’t really dug too deeply or gotten my hands on one of their helmets yet. With any new product like this, I tend to be skeptical. Lots of people have great ideas. Fewer are able to execute them in a meaningful way. 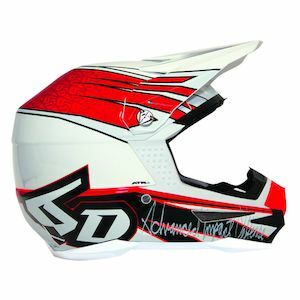 The 6D ATR helmet has found its way onto more and more racers and has been widely adopted by even the top guys in Supercross. Justin Bogle and Eli Tomac (that's one of his helmets at right, cut away to show the technology) both wear them when they could be getting paid more to wear something from one of the bigger brands, which adds weight to their testimonials. What makes the 6D ATR helmet different from others? The answer goes back to the most basic question of all. What is your helmet supposed to protect? DOT, SNELL, and ECE standards are primarily designed to ensure a helmet protects the skull. They answer a problem from decades ago when helmets simply didn’t do a good job of protecting our craniums from being crunched during a fall. During a recent visit to the Bell headquarters, I saw the DOT and Snell tests replicated and I can tell you from first-hand experience, that is one gnarly impact. Weber shared with me a great deal about how closely 6D works not only with the bodies that create the safety standards, but also with the medical community to use their understanding of head and brain protection. While Snell and DOT helmets protect your skull in those catastrophic crashes, the folks at 6D set out to do more to protect your brain. Rotational or angular acceleration energy causes the brain to spin, rotate, or sheer inside the skull and is the major cause of concussions and brain injury in a crash. 6D cites studies by David C. Viano, PhD. and M.D., and the Bioengineering Center at Wayne State University, that showed that a helmeted head sustained the same degree of angular acceleration as an un-helmeted head when subject to identical impacts. 6D tries to solve this problem with its Omni-Directional Suspension (ODS) system. The goal of ODS is to help solve the problem of rotational acceleration as well as reduce the odds of a concussion in low-energy impacts. Not your average EPS liner. Photo by Sean MacDonald. This is achieved through 54 “elastomeric isolation dampers,” which are used to connect an inner and outer EPS liner, instead of the usual one EPS liner. There is a whole science behind the methods used to create and attach those, but we’ll save that for another day. (If you are interested in digging into this further, 6D has a ton of charts and graphs on its website, including its detailed press kit in the media section.) Meanwhile, think of ODS as a suspension system for your head. While the hard outer shell of a helmet is there to prevent punctures, it's the EPS liner that is intended to absorb the shock of an impact. The ODS system allows the inner and outer EPS liners to rotate slightly within each other. That doesn’t mean your helmet is going to spin around your head, but when severe pressure is applied, there is some give. The elastomeric isolation dampers were designed to offer easier movement laterally and be stiffer when direct force was applied. 6D says its testing shows the ODS system reduces the angular acceleration to the head by as much as 80 percent. We obviously don’t have the ability to verify those claims, but the testing was done by Dynamic Research in Torrance, Calif. In addition to the ODS’s effects on rotational acceleration, it also has positive effects in low-velocity impacts (read: minor hits). Where the EPS is designed to withstand impacts until a certain level of energy and then crush, the ODS acts like a suspension or cushion system inside the helmet and can buffer the impacts of minor crashes before the EPS gets to its crushing point. 6D found that ODS technology could reduce the G forces transferred to the head by as much as 38 percent in low threshold tests. On top of all that, those little elastomeric isolation dampers have extremely positive effects in increasing the amount of time the deceleration of an impact takes. 6D’s studies show that their helmet increases the time from when the impact occurs to the time the full energy of the impact is transferred to the helmet by more than 150 percent. Think of it as seeing the child run into the street and having to stop from 50 feet away instead of 20 feet away. The 6D ATR Helmet. Photo by Sean MacDonald. I was fortunate enough to leave my time at 6D with a 6D ATR Dirt Helmet to test. I was a bit worried the helmet would be bigger or feel heavier, given the additional structural components, but that does not seem to be the case, at least on first impression. My favorite dirt helmet lately has been the Bell Moto-9 and the two feel very similar in size and weight when held in each hand. I also wondered how much give the suspension system would have while the wearing the helmet, but I can’t feel its effects unless I tug on it hard. 6D’s helmets seemed good in theory from the moment I read about the company. After spending some time with their staff, I really appreciate the lengths they’re going through to make sure their helmet is as safe as they can possibly make it. I feel like I’ve been saying this a lot lately, but I'm happy to see innovators taking the safety conversation in new directions. In the meantime, I can’t wait to get out and see if this thing is really all it’s cracked up to be — without cracking up myself.